Back to work and to our daily routine after an intense period of festivity, how many of you are still thinking about the way they have spent their Christmas period, enjoying the excitement of children waiting for their gifts, the hugs and greetings of families meeting up together, the feasting, the laughter, the lights and the good and delicious culinary dishes to eat? It’s a delicious thought, remembering these few small but important rituals that at Christmas are common everywhere. But, did you know that many of them have Italian origins? If you are curious to discover how some of the traditional Christmas rituals, that you just experienced, were born and developed throughout the world, we invite you to read this brief article….it will surprise you, also providing you a sweet memory of the Christmas period that is already behind us!! So, enjoy reading!! Besides the Christmas Tree, which is not exactly a Christian symbol but nowadays has acquired a central and indispensable role, thanks to multiethnic influences, the thing that Italian families can’t really live without at Christmas is the crib: every house keeps a special corner for the Nativity scene. Some simply have the hut with the main characters, others spend more time and show more imagination reproducing small villages and landscapes, placing lights, creating small lakes and rivers (either made of real water or with silver paper, if you need some tips!! ), putting moss and stones along the narrow streets. 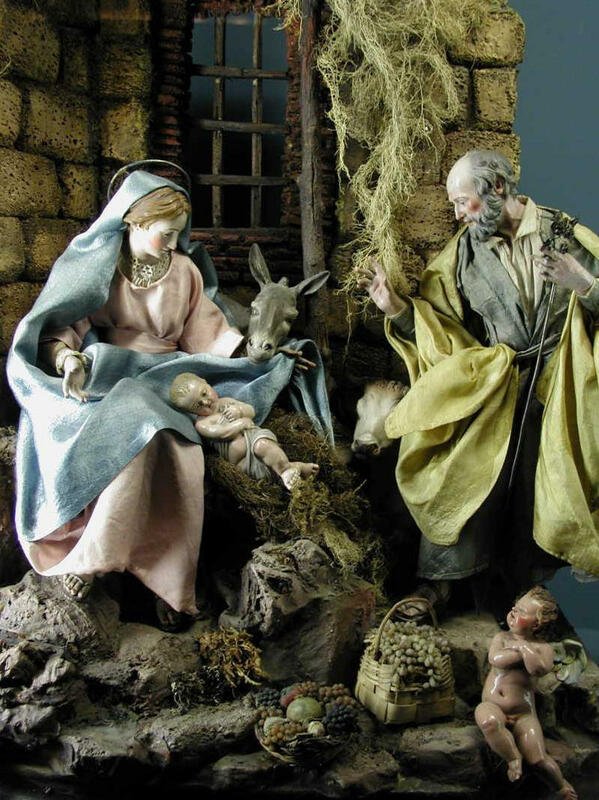 But, how many of you knew that this tradition started in a small Italian village called Greccio, in Umbria, where the first example of the crib was created? In fact, in 1223, in this small village situated between the Umbria and Lazio regions, in the center of Italy, St Francis gave a demonstration of the first crib: his intention was to show his followers the miserable and damp conditions in which the Baby Jesus was born. Inside the small church of Greccio, he put the manger next to an ox and a donkey, and there, on the hay, he put a little baby, living symbol of the Lord made Man. This was the first living crib in history, which ever since then is commemorated at Greccio during the Christmas period, year after year, and whose memory will remain impressed forever, also thanks to an amazing fresco by Giotto painted in the Basilica of Assisi. A few years later, Arnoldo Di Cambrio, carved the first inanimate Nativity scene, whose statues are still preserved in Rome. 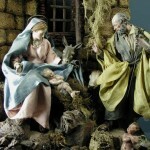 With the passing of time, the crib became a real form of art that quickly spread all over the Italian peninsula. Between the 16th and 17th century, the Nativity started being contextualized into a real scene: in this way, the cave or the hut, that hosted the Holy Family was placed in a village, which looked very different from contemporary Palestine, to arrive at that magic mix we are used to seeing in our houses nowadays, with eastern palms covered by fake snow, made with white spray or cotton-wool (a few more tricks for those who are tempted to create their own crib for next Christmas!!). In Italy, it is in Naples that the real artisan heart of cribs remains, where skill melds with imagination: the district of San Gregorio Armeno, in particular, in narrow streets not too far from the historical center. From November, this street of cribs becomes one of the main tourist attractions of the city. However, this is not the only Italian city dedicated to the Nativity: at Dalmine, in the province of Bergamo, there is a specific museum which stays open the whole year, and a collection of sacred representations from all over the world can be visited at the Oropa Sanctuary, in Piemonte region. What about the Italian “Babbo Natale”, also known as Santa Claus? In Italy he is not the only one to fly from chimney to chimney, carrying bags full of gifts for the good children. Here, according to ancient traditions, he was provided with two reliable assistants. The most famous, and also the busiest one, is “Saint Lucia”: her saints day is the 13th December and it is her that children from many Italian regions, especially in the north, ask for gifts. The Saint comes from Sicily and, according to the tradition, she passes from house to house on her donkey to leave gifts and candy for children. In the Veneto region, there is also “Saint Niccolò”, who, as happens in many other European countries too, leaves gifts on the 6th December. Here children are allowed to walk with the Saint, who looks very similar to Santa Claus, with a red mantle and a white beard, except for the hat: in fact Saint Niccolò wears a red archbishop’s cap. It’s not finished yet!! In fact, the 6th January is Epiphany, and a very old lady, that Italian children call “Befana”, covered in rags, flies in the sky with a magic mop leaving candy and gifts for the good boys and girls, but ash and coal for the bad ones!!! To feel and live the real Christmas atmosphere, we suggest you to organize a visit, for next year, to one of the numerous small markets that crowd the Italian squares, from the North to the South, with specialities for every taste!! What about the Christmas traditions in your country? Do they differ a lot from the Italian ones? Please, let us know how you have welcomed the Christmas period, we would like to share the information with all our readers!